Liège Airport (IATA: LGG, ICAO: EBLG), previously called Liege-Bierset, is an international airport located 5 nautical miles (9.3 km; 5.8 mi) west of Liège in Wallonia (southern Belgium), mainly focusing on air freight. At the end of 2015, it was the 8th biggest cargo airport in Europe and the 22nd biggest in the world. 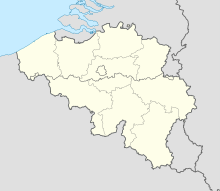 The airport is located in Grâce-Hollogne, Liège Province, north-west of the city of Liège, in the east of Belgium. The first terminal on the site opened in 1930. It is mainly used for freight/cargo operations, but also serves more than 23 destinations for passengers (mainly charters). Liège is located in the centre of the golden triangle Paris - Amsterdam - Frankfurt that handles 66% of European freight, and 75% when taken together with London. In 2014 it was the eighth-biggest cargo airport in Europe. Liège Airport is the biggest cargo airport in Belgium, and the third-biggest for passengers after Brussels Airport and Brussels South Charleroi Airport. It is the global hub of ASL Airlines Belgium (the former TNT Airways), the European hub of Allied Air, Astral Aviation, CAL Cargo Air Lines, El Al Cargo, Ethiopian Cargo, and Icelandair Cargo, and a key European cargo hub for ABX Air, AirBridge Cargo, Bluebird Cargo, Emirates, i-Fly and Ukraine International Airlines. The airport is located next to the E42 (exit 3), close to an important highway junction. A special bus (number 57) links the airport to Liège main train station (Liège-Guillemins) where connections can be made with local, national and high speed international trains (Thalys, ICE). Bus number 53 goes to Liège city centre (Place Saint-Lambert) where connections are available with Liège public transport system. ^ GmbH, DVV Media Group. "Airport insight: 2015 cargo results". aircargonews.net. ^ "Liege Airport". Retrieved 7 June 2015. ^ "Vols liege - Billets d'avion liege - TUI fly, avant Jetairfly". www.tuifly.be. ^ Ltd, DVV Media International. "Air China Cargo lands at Liege Airport". Air Cargo News. ^ Morales, Irais García (6 September 2017). "CAL Cargo Airlines aterriza en México". T21. ^ "Ethiopian Airlines launches historical cargo route at MIA". www.prnewswire.com. 30 August 2018. Retrieved 30 August 2018.